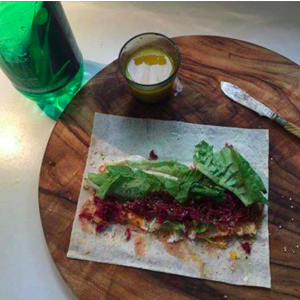 On ‪spelt‬ ‪mountain bread‬ – (immune booster), I scraped ‪byron bay miso‬ paste, (for gut health thus immunity) then an egg from my neighbour, topped with ‪alive foods‬ pickled beetroot + red cabbage (probiotics, Vitamin C and A for immunity), lettuce from my garden and ‪made in hemp‬ Canadian hemp seeds (for immunity). A big shot of Jamu (turmeric + lemon drink – a great anti inflammatory) and ‪Lifestream‬ ‪‎aloevera‬ for allergies. Now for a walk amongst the spring pollen. I’m ready!